The OSISoft PI System is a realtime data management infrastructure. At the heart of the PI System is a high performance historian and asset framework that provide access to both current and historical data. TopView PI allows you to easily monitor, alarm, report, and send notification (Email, SMS, Voice callout, …) for PI tags, PI tag expressions, AF attributes, and AF attribute expressions read from one or more PI/FTH Servers or AF Servers. The image to the right gives an overview of the PI and PIAF data sources in TopView PI. On the left is the PI data source, TopView’s long-established PI-based data source for monitoring PI tag data from one or more PI Servers. Our PI data source uses the PI-SDK to monitor PI tag values and PI tag expressions to detect alarm and abnormal events. On the right is the PIAF data source, our newer PI-based data source for monitoring both PI tag and AF element attribute data. In addition to monitoring expressions of PI tags, PIAF also supports expressions involving AF element attributes. The PIAF data source is therefore a superset of the PI data source. 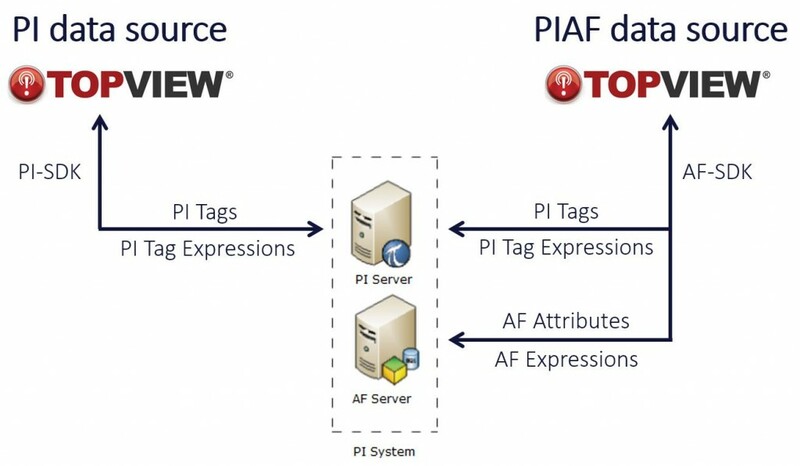 All tag-based value and expression monitoring supported in the PI data source are supported in the PIAF data source, but the PIAF data source also includes attribute and attribute expression monitoring. Starting with TopView version 6.26, our TopView for OSIsoft PI product includes both the PI and PIAF data sources so you can choose the one that is right for you. Once the PI data values are retrieved by TopView, all other TopView features work the same.